A village in the west of Ireland, a human skeleton unearthed at a building site, gossip about old love triangles, and a bumbling local police sergeant: all the ingredients for a classic cozy mystery novel. 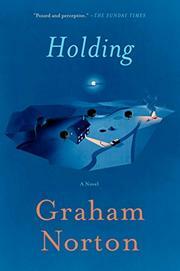 Holding is indeed that, but it goes beyond the genre. In Holding, Graham Norton has produced some noteworthy character studies of mature people who are at turning points in their lives. He has readers sympathizing with the middle-aged police sergeant, PJ Collins, who is overweight, underutilized, and desperately lonely. Norton also pulls us into the plight of middle-aged Brid Riordan, who loves her kids but often gets drunk to forget how unhappy her marriage is. Another character is Evelyn Ross, who’s stuck in the past, lamenting a failed romance from twenty-odd years ago. There’s also PJ’s elderly housekeeper, Lizzie Meany, whose background is revealed in a heartbreaking and surprisingly violent segment of the novel. The mystery plot is not that tricky for readers who read a lot of cozies—I guessed the identity of the bones early on and had a good idea who buried them by the midpoint of the book. Still, the climax of the book, with the solution of the mystery, was suitably tense for me. It’s the unraveling of the story, with the appropriate red herrings, that gives the author scope for more interactions of his characters. PJ, for example, compromises his professionalism in his dealings with two of the murder suspects, and Brid makes some major changes in her family situation. Holding has such a classic-1930s-mystery vibe to it that modern elements like DNA testing and mobile phones seemed slightly odd at first, but Norton skillfully integrates twenty-first-century technology into a rural Ireland that in some ways has not changed for a century—the pubs on the main street, the church fete, the outlying farms and hedgerows. He does allow, of course, for occasional lapses in phone reception that will advance his plot! The epilogue of Holding contains suggestions that more adventures of Sergeant PJ Collins may be forthcoming. I hope Norton takes time from his television career to produce another PJ mystery. I’ll be on the lookout!